Iran has taken steps in recent days to file what it claims are 18 instances in which America violated the landmark nuclear agreement, a move that could set the stage for Tehran to abandon the deal and lay blame on the Trump administration, according to regional reports and sources familiar with the matter. On the heels of an effort by the Trump administration to tighten the nuclear accord while still upholding U.S. commitments under it, the Iranian Foreign Ministry has submitted to European Union leaders a plethora of information recounting what it claims are 18 separate violations of the deal by the United States, according to Iran's state-controlled media. The latest move is said to be part of an effort by Iran to abandon the nuclear agreement and save face by blaming the United States for its decision, according to national security insiders closely tracking the situation. As the Trump administration makes moves to sanction Iran for its ballistic missile program and regional support of terrorism, Iran is increasingly frustrated with the United States' aggressive stance, which is being spearheaded by President Donald Trump and his congressional allies. Iran's foreign ministry submitted a report to the country's Parliament outlining what it claims are at least 18 instances of the United States violating the agreement. The accusations come just days after Trump decertified Iranian compliance with the nuclear deal. "The recent report is specifically about the Americans' efforts to derail the JCPOA [Joint Comprehensive Plan of Action], so much so that the foreign ministry has delineated 18 blatant cases of breach of the agreement made by U.S.," Heshmatollah Falahatpisheh, an Iranian member of parliament, told the country's state-controlled media organs on Tuesday. Iran's foreign ministry is said to have forwarded this information to Federica Mogherini, the EU's high representative of the Union for Foreign Affairs and Security Policy, one of the international organizations monitoring compliance with the agreement. "The foreign ministry has forwarded ten letters to Ms. Mogherini in this regard, and the base of the report is on the continuation of sanction-era situation in areas of maritime transportation, oil and gas export, and the return of the revenues," according to Falahatpisheh. While the Trump administration has withheld from commenting on Iran's increasingly aggressive rhetoric, officials told the Washington Free Beacon that the United States continues to uphold its commitments under the deal and will continue to do so. "I'm not going to comment on every statement by an Iranian official," a State Department official told the Free Beacon after reviewing Iran's accusations. "The United States continues to meet its commitments under the JCPOA and will hold Iran strictly accountable for its commitments." One veteran congressional adviser who has helped craft Iran policy during the last two administrations told the Free Beacon the Islamic Republic's latest moves are meant to distract from its widespread cheating on the nuclear accord. "Iran was never going to stay in the deal the full time," the source said. "They were going to cheat as much as they could, pocket as much as they could, and then bail as soon as anyone tried to enforce the deal." As the Trump administration works to tighten the deal and hold Iran accountable for its continued nuclear endeavors, Tehran may see an opportunity to abandon the deal before its clandestine activities are exposed. "Now they see the Trump administration is working to fix the verification loopholes in the agreement, so they know the clock is ticking on how much longer they can cheat with impunity," the source said. "So of course they're already making up excuses to leave and fabricating U.S. violations." The Trump administration's efforts to hold Iran accountable for its repeated violations of the deal, as well as its support for regional terrorism, has sparked outrage among Iranian leaders, who have lashed out at the U.S. president in vitriolic terms and vowed that Iran will continue its massive military buildup. 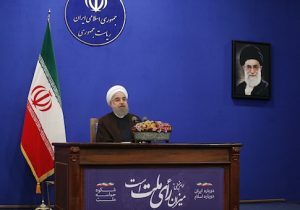 "We have previously declared, and once again we declare that the defense capabilities of the country are non-negotiable and not to be bargained for," Iranian Supreme Leader Ali Khamenei said on Wednesday. Khamenei promised to continue building Iran's ballistic missile program, which has been an ongoing source of international tension. "That they ask, why we have some defense facility, why we produce them, or why do we conduct research; these matters are non-negotiable!" Khamenei was quoted as saying. "We won't negotiate with the enemy on matters that provide us with our national sovereignty."